But the big peanut butter egg with my name written on top was my all time favorite thing to get at Easter. My Grandma ordered them from somewhere in the area every year for each of us. We carried on this fun tradition with our own kids. Every Saturday before Easter we would do an egg hunt either in the yard or in the house. Of course, the one Easter egg hunt they remember the most was the flashlight egg hunt. It was a very rainy and cold Easter one year, so we waited until Saturday night and hid the eggs and Easter baskets all over the inside of our house. We gave each of the kids a flashlight and an empty basket and set them loose in the dark house. 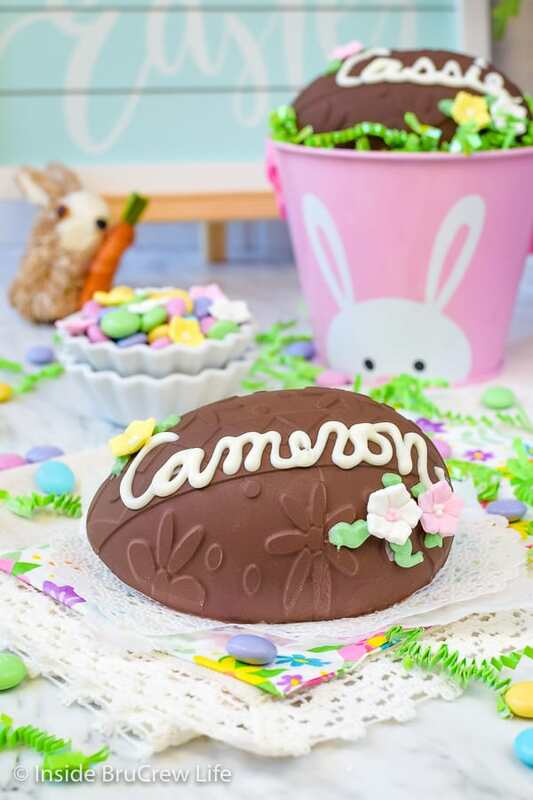 Of course, a giant peanut butter egg with their name on top has been a fun tradition to carry on. 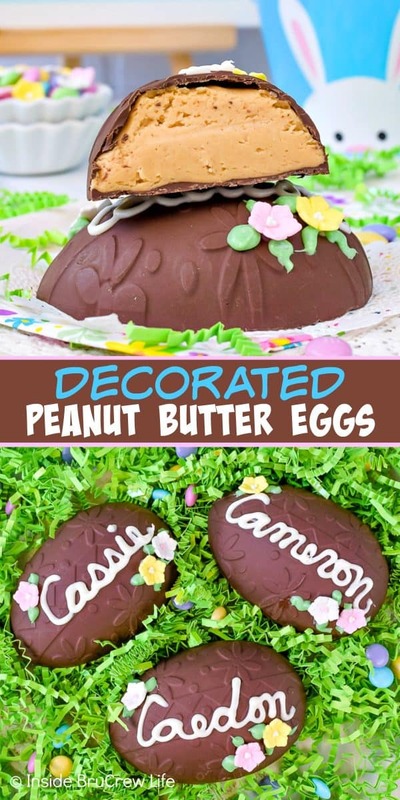 Every year the kids start to ask if I’m going to make these fun peanut butter Easter eggs. And every year, I make a batch of these Peanut Butter Balls and divide it into three chocolate eggs for their baskets. 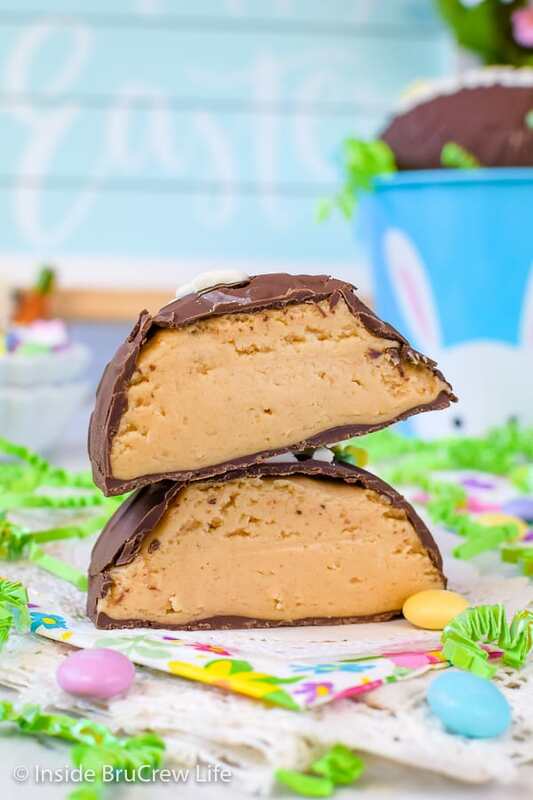 We usually make three eggs out of the peanut butter filling, but you can make smaller eggs and dip them in chocolate instead of using the molds. Also, if you or a family member are allergic to nuts, make these Biscoff Cream Eggs instead. The cookie butter filling works just as well as the peanut butter one in the molds. Beat the butter, peanut butter, marshmallow cream, vanilla, and salt until nice and creamy. Slowly add the powdered sugar and mix until a soft dough comes together. 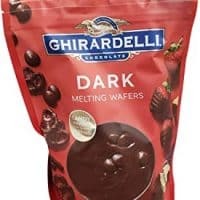 Melt the dark chocolate melts according to the package directions. Place a spoonful in the bottom of the egg molds and use the candy paint brush to coat the entire inside of the egg. Refrigerate the molds for a few minutes, then paint a second coat on the eggs and refrigerate again. You want to get a nice thick coat so the chocolate does not break. Fill the eggs with the peanut butter mixture making sure to leave a little room at the top. Place a spoonful of chocolate on top of the peanut butter and spread out. Refrigerate for a few minutes before popping them out of the molds. 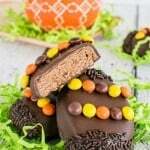 *I used a large silicon egg candy/cake mold that I found out Michaels. It makes an Easter egg that is about 3 inches by 4 inches and 1 1/2 inches tall. 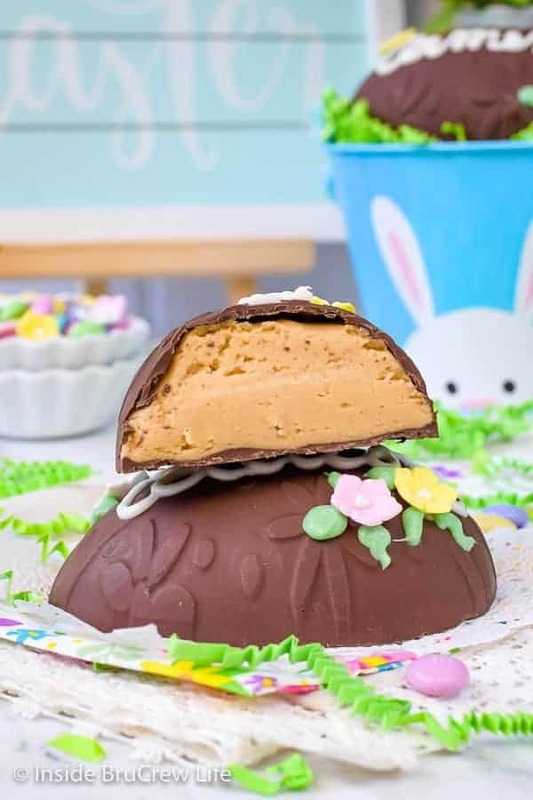 If you cannot find a large mold, you can also shape the peanut butter filling into an egg shape and dip and cover the egg in chocolate using a large spatula. If you do this method, make sure to melt enough chocolate to cover the tops and sides. Melt the white chocolate according to the package directions. Place a few spoonfuls in a plastic bag and cut a tiny corner off. 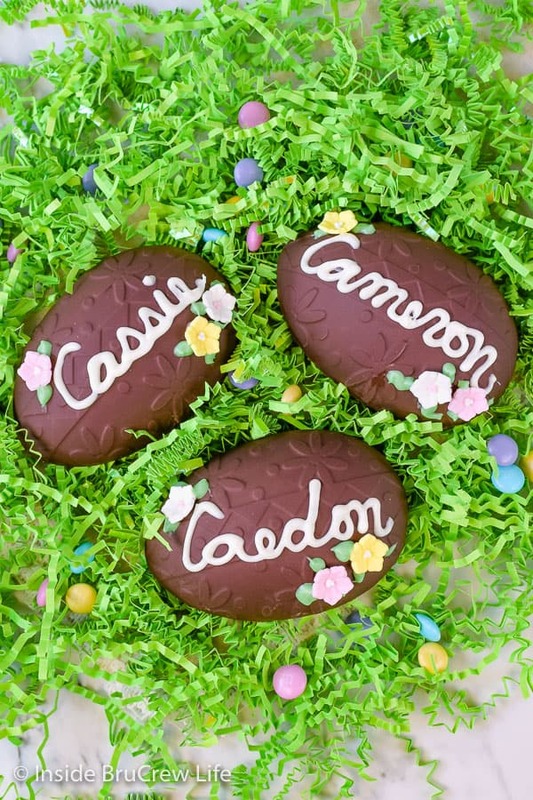 Write the names on the tops of the candy eggs. Place a small dab of chocolate on the backs of the candy flowers and place them on the eggs. Make sure to hold each one for a few seconds so they stay in place. Use the green gel coloring to tint the rest of the white chocolate green. Spoon this into a plastic bag and cut one tiny tip off. Squeeze the green chocolate gently around the flowers to make leaves and stems. Let set. 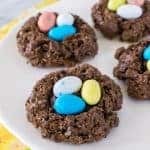 These cute little Chocolate Covered Marshmallow Bunnies are a fun treat to make with your kids. They make the cutest little centerpiece if you fill a vase with them too. 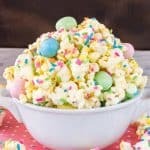 Sprinkles and M&M’s will make these Easter Rice Krispies Treats disappear in a hurry. They are so soft and delicious!! 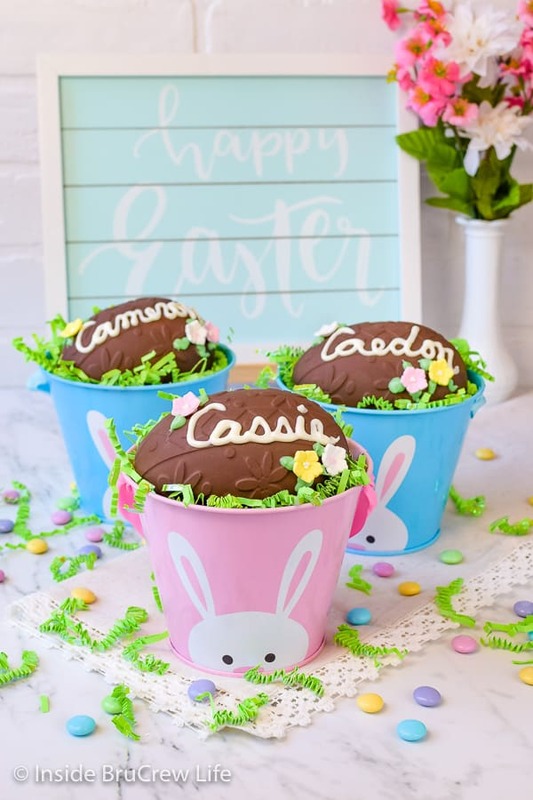 Serve these cute little Party Peeps Eclair Cake Cups for Easter dessert. 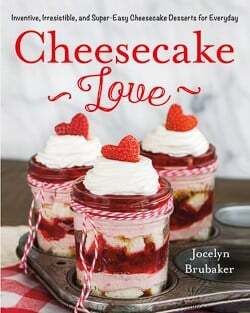 The layers of pudding and graham crackers will have everyone asking for more. 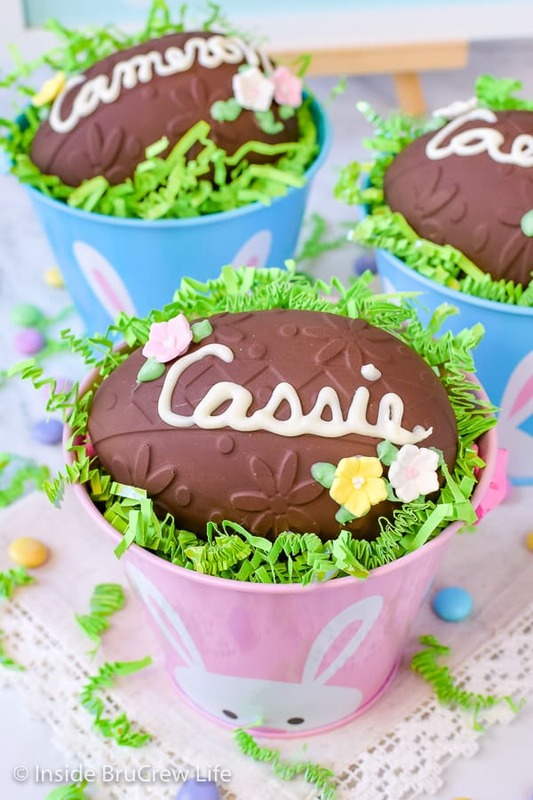 Decorated Peanut Butter Eggs are a family tradition that happens every Easter. 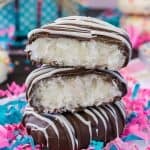 A smooth peanut butter filling covered in dark chocolate and candy flowers is a fun treat to put in Easter baskets. Beat the butter, peanut butter, marshmallow, vanilla, and salt until creamy. Slowly add the powdered sugar and mix until a soft dough forms. Drop a spoonful in the bottom of the egg mold and use a candy paintbrush to paint the sides of the mold. Refrigerate a few minutes to harden. Repeat this step. Fill the mold with the peanut butter mixture leaving a little room at the top. Place another spoonful of melted chocolate on top and spread it out covering all the peanut butter mixture. Refrigerate a few minutes, then gently remove from the mold. Repeat with the remaining ingredients. 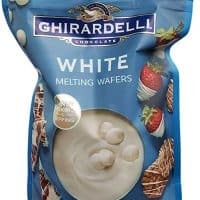 Melt the white chocolate melts and spoon a few spoonfuls into a ziplock baggie. 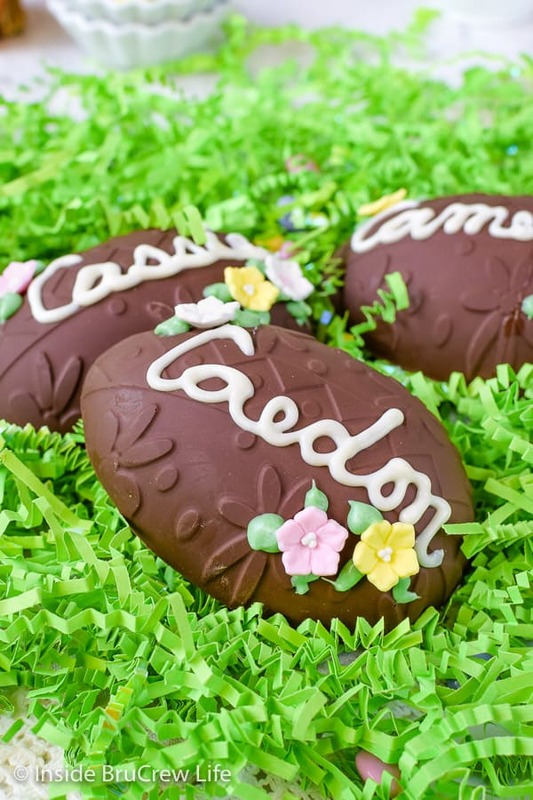 Cut one tiny corner off and spell the name on top of the eggs. Add some green gel coloring to the remaining white chocolate until you get the color you are looking for. 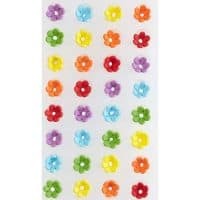 Place a small bit of chocolate on the backs of the candy flowers and place on the eggs. 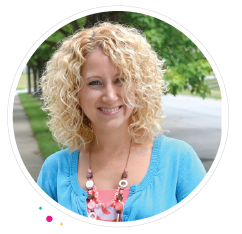 Hold for a few seconds until they stay in place. 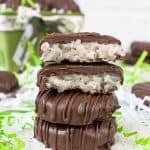 Place the green chocolate in a ziplock bag and cut a tiny corner off. Squeeze a little bit around the flowers to give the look of leaves. Let set. These are so beautiful! They remind me of very special chocolate eggs that my mom would buy for us each year at Easter. Such a classic and pretty treat. What a cute idea! My girls will love waking up to these on Easter. 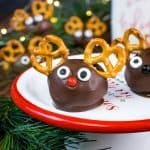 I can’t even believe you made these because they are just TOO cute! I love this!!! Okay these are awesome! Peanut butter eggs are my favorite!